Let us understand this with an example. 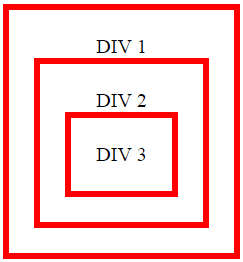 HTML elements can be nested inside each other. For example a button element can be nested inside a span element and the span element in turn can be nested inside a div element as shown below. Notice that we have onclick attribute specified for all the 3 elements. A click on the button, causes a click event to be fired on the button. The button click event handler method handles the event. The click event then bubbles up to the button element parent (span element), which is handled by the span element event handler method. The click event then bubbles up to the span element parent (div element). This is called event bubbling. Notice that if you click on the <span> element, it's event handler and it's parent(<div>) element event handler are called. 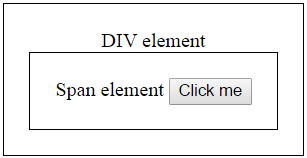 If you click on the <div> element, just the <div> element event handler method is called. So, the event bubbling process starts with the element that triggered the event and then bubbles up to the containing elements in the hierarchy. The following example is similar to the one above, except we removed the onclick attribute from button and span elements. Because of event bubbling, when you click on the button or the span element, the event gets handled by the div element handler. When the event gets bubbled, the keyword this references the current element to which the event is bubbled. In the example below, we are using "this" keyword to reference the current div element and change it's border color. When you click on the innermost <div> element, all the 3 <div> elements border get changed due to event bubbling. Stopping event bubbling : If you don't want the event to be bubbled up, you can stop it. In the example below we have stopped event bubbling. So, when you click on DIV 1, only DIV 1 border colour is changed.